Nick and Graham talk about what they’ve learned in the year since they started the podcast. Nick talks about cameras that get out of your way but also cameras that do get in your way. Graham talks a bit about shooting on a vacation with a Minox 35 GL zone focusing aperture priority camera. Graham talks about the approach to building cameras that includes more parts (36:35) for better functionality and not trying to put as much functionality as possible into each part. He also rambles on about how the most important thing we do is take images and the image is way more important than the camera, lens or the film. (47:00). Nick counters that while it is true, he would rather have access to that information on others’ photos. The issue of the differences between cameras, lenses and film is much less apparent than the differences between different photographers’ abilities with post-processing tools. The hosts lament the lack of a reliable shutter for homemade cameras are not readily available (55:00) and that lack of access is a major factor in keeping us from producing reliable cameras that use existing lens systems. Graham stumbles around, trying to figure out what Raffaello Palandri’s name is, even calling him Franco Zeffirelli (https://www.imdb.com/name/nm0001874/) at one point. What can we say, Graham is an idiot, first class. They even talk about not editing Graham’s idiocy out of the episode. Instead, of sending the hosts hate mail, go to Raffaello’s PONF Camera website (https://ponfcamera.com/) which is way more effective and edifying. On an entirely more fun note (1:05:45), the Homemade Camera Fun(d)raiser Zine is open for submissions! 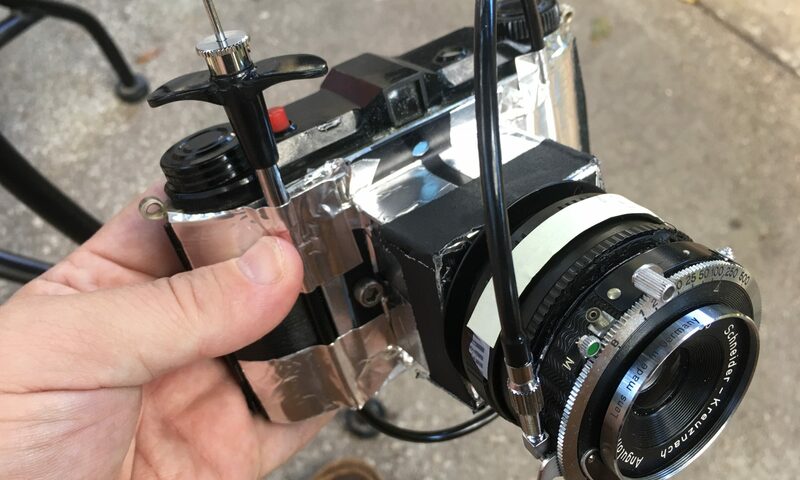 Go to http://homemadecamera.com/homemade-camera-zine-submission-form/ and click on the link for the Zine Submission Form. All of the information is there for you to see! Finally, Graham announces a new podcast he’s doing (1:12:35), Get Started With Film Photography Podcast (http://getstartedwithfilm.com/), a podcast that is focused on beginning photographers and people who are just getting back into film photography. Nick was on the Classic Lenses Podcast Episode 61 (1:19:10) (https://www.classiclensespodcast.com/e/61-tbd-1552847955/) where he baffled Simon and Johnny for a large portion of the show. We also mention the Large Format Photography Podcast (https://largeformatphotographypodcast.podbean.com/) that Simon Forster of the Classic Lenses Podcast and Andrew Bartram of the Lensless Podcast do on a semi-monthly basis (or so). Nick wants to announce something but he forgets what it is (1:23:25). And that’s pretty much it for our first anniversary show. We’re one year-old!